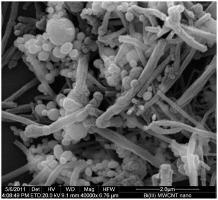 It is of great importance to develop a rapid analytical method for enhanced quantification of antiviral drug famciclovir in cetyltrimethyl ammonium bromide (CTAB) surfactant at Bi2O3/MWCNTs modified glassy carbon electrode. Glassy carbon electrode was modified with mechanically attached nanoparticles of bismuth oxide (Bi2O3) and multi-walled carbon nanotubes (MWCNTs). Modified electrode was characterized by scanning electron microscopy (SEM). Electrochemical performance of Bi2O3/MWCNTs modified glassy carbon electrode showed stable response with enhanced selectivity and sensitivity. Under the optimal conditions, the peak current response increased linearly with increasing concentration of famciclovir in the range 400–1100 µg/mL followed regression equation ip=0.0053x-0.6543 (r2=0.9929) and the limit of detection is 104.85 µg/mL. The modified electrode was successfully used for the selective determination of famciclovir in pharmaceutical formulation.